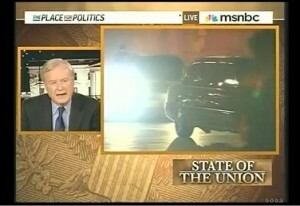 *It appears that Chris Matthews was all flustered and discombobulated with adoration for President Obama Wednesday night after his first State of the Union address. He was actually blushing and gushing like a school girl. But, that disheveled energy has thus far put him in the hot seat. But, I for one say, “Kudos! Mr. Matthews!” for letting your little light shine. The perspective that you gave in this “post racial” time is a double-edged sword.